Since April 2016, I have served as the Small Grains Extension Specialist at Oklahoma State University. My research and extension efforts focus on delivering science-based recommendations in order to increase small grains production and profitability for stakeholders throughout Oklahoma and the southern Great Plains. It occurred to me the other day that although I have publicized the forage, grain, and quality results from the OSU Wheat Variety Testing Program, I have never really given much effort to publicizing the day to day activities required to produce these results. So, over the next year I hope to write a few blogs to provide a little more insight into the workings of the system. Our program will have replicated trials at 23 sites in 2013/2014. These sites cover the state from Afton to Altus and McLoud to Keyes and some sites (e.g. Apache, Lahoma, Chickasha, Goodwell) have multiple trials. The location of trials are decided upon by throwing darts at a map (just kidding). We pick trial locations according to many factors including: visibility, uniformity, production history, local support, and cooperator involvement. Some locations (e.g. Lamont) have been in the system from the start, and others (e.g. McLoud) are fairly new additions. Given the miles between locations and a finite number of planting and harvest days, 23 locations is about the maximum we can handle and still complete operations in a timely fashion. In addition to the small, replicated plots we organize and distribute ten-pound demonstration bags for County Educators. We typically have about 40 sets of 15 varieties for these ten pound “demo sets”. The bulk of the expense of running the program comes in the form of salary, facilities, and miscellaneous overhead expenses and is largely covered by OSU through state appropriations (i.e. Oklahoma taxpayers). The bulk of the day to day operating expenses, such as seed, fuel, and mileage expenses, are covered through grants from the Oklahoma Wheat Commission and Oklahoma Wheat Research Foundation (i.e. Oklahoma wheat farmers). These two organizations also help with large equipment purchases such as tractors and combines. A relatively new area of support for the program is an entry fee system. The $500 per variety fee helps offset increasing expenses and is generally enough to assist with student labor for the project. We typically employ one or two graduate students and one or two undergraduate workers. Yes, we charge licensees for testing released OSU varieties but do not charge for OSU experimental lines. Once we have determined which varieties will go at each location, we will send seed requests to participating companies. If everything goes well, we will receive seed in late August. We request one bag of most varieties and eight bags of varieties that will be included in the county demonstration packets. Depending on the location, there are 25 to 45 varieties replicated four to eight times at each site. Each one of these plots starts with an envelope with either 60 (grain only) or 120 (dual purpose) grams of seed (120 grams is approximately 1/4 pound). This creates a total of about 4,000 envelopes that are weighed and packaged by hand each year. Envelopes are sorted according to a plot plan which randomly assigns varieties to locations within the field at each site. The plots plans are all created one at a time in Excel. We have two planters. Our conventional planter sows eight six-inch rows and our no-till planter sows seven 7.5-inch rows. Seed is dropped into the distribution cone and released in the five foot alley between replications/blocks. A gear box is used to adjust the length of row over which the seed will be distributed. We work the ground with a small field cultivator at some locations and the producer or station manager works the ground for us at others. 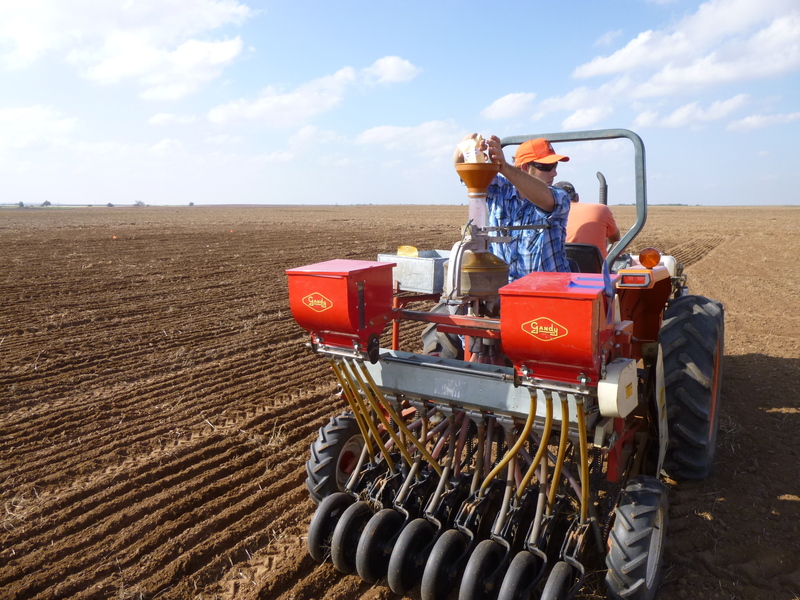 Robert Calhoun and Matt Knori sow the 2013/2014 wheat variety test plots at Alva, OK. Robert is dropping a 60 gram envelope of seed into the cone that will evenly distribute the seed across eight six-inch rows over a distance of 25 ft. The red boxes on the back are for 18-46-0 (DAP). We apply 50 lbs of DAP in furrow at all locations. 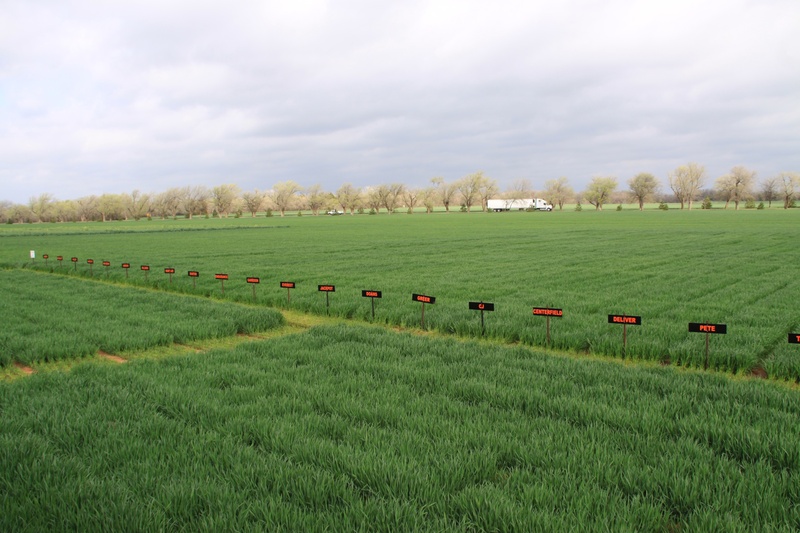 By osuwheat in variety testing, wheat on October 8, 2013 .